WATERLOO – The nation’s finest young classical musicians and their instructors will be featured in performances as the National Youth Orchestra of Canada wraps up another successful summer training institute at Wilfrid Laurier University. The performances will take place at the Maureen Forrester Recital Hall on Laurier's Waterloo campus and the Kitchener-Waterloo Chamber Music Society through July 15. Members of the National Youth Orchestra took up residence at Laurier on June 20 as part of the orchestra’s annual summer training institute, which has been hosted by the university's Faculty of Music since 2013. During its time in Waterloo, the orchestra presents the National Youth Orchestra Chamber Music Festival, comprised of a series of faculty and student concerts. Details about the upcoming concerts can be found below. During a history spanning more than half a century, the National Youth Orchestra has become one of the most recognized orchestral training institutes in the world, providing comprehensive, in-depth instruction to Canada's best young classical musicians. 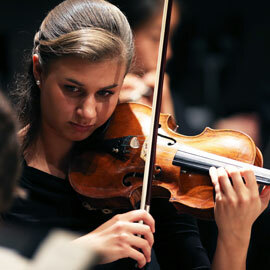 Each year, the orchestra auditions about 500 students between the ages of 16 and 28 for its summer training institute. From those students, 90 to 100 are selected to participate. Following its time at Laurier, the National Youth Orchestra will perform at the Elora Festival before embarking on an eight-concert tour of Portugal. The orchestra will return to Canada in mid-August to perform concerts in Montreal and Toronto. Wednesday, July 6 – 8 p.m. to 9:30 p.m.
Tuesday, July 5 – 8 p.m. to 9:30 p.m.
Friday, July 15 – 8 p.m. to 9:30 p.m.